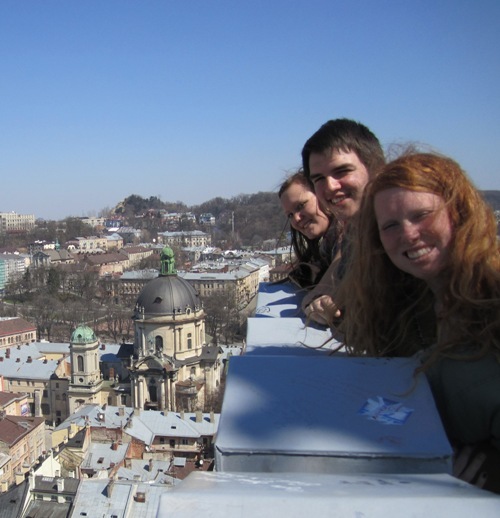 When you are in Lviv on the EESA academic field trip, you will feel like you have arrived in Western Europe. 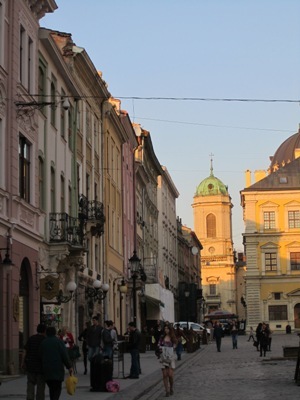 Visitors claim Lviv to be the Prague of Ukraine. The city has beautiful blend neoclassical architecture in rococo, baroque, Renaissance and Gothic. Ancient cobble stone streets are lined with numerous small cafes, coffee shops, unique museums and beautiful cathedrals. You will visit many of Lviv’s attractions including: Ploshcha Rynok (Market Square), Armenian Cathedral, St. Georges’ Cathedral and many other beautiful churches, Opera House, Old Town, Lviv City Center, the History and Pharmacy Museums, Lviv’s famous chocolate factory/store, Venice palace, Mazanzc palace, Zuchorowizc’s palace, climb the tower in the town hall to get a great city view and much much more! L’viv is the largest city and cultural center of western Ukraine, with around 800,000 inhabitants. The culture and architecture in comparison to Kyiv or other Ukrainian cities farther east has a noticeably more European flavor. This is, in part due to the fact that L’viv was a part of some five or so different countries over the past 120 years. The city is regarded as one of the main cultural centers of today's Ukraine and historically has also been a major Polish and Jewish cultural center. Poles and Jews were the two main ethnicities of the city until the outbreak of World War II and the following Holocaust and Polish population transfers (1944–1946). L’viv is also a home to many world-class cultural institutions, including a philharmonic orchestra and the famous L’viv Theatre of Opera and Ballet. The historic city centre is on the UNESCO World Heritage List. L’viv celebrated its 750th anniversary with a son et lumière in the city centre in September 2006. L’viv was founded in 1256 in Chervena Rus' by King Danylo Halytskyi and named in honour of his son, Lev. Together with the rest of Chervena Rus', L’viv was captured by the Kingdom of Poland in 1349 during the reign of Polish king Casimir III the Great. L’viv belonged to the Crown of the Kingdom of Poland 1349–1772, the Austrian Empire 1772–1918 and the Second Polish Republic 1918–1939. With the Invasion of Poland at the outbreak of the second World War, the city of L’viv neighboring areas were annexed and incorporated into the Soviet Union, becoming part of the Ukrainian Soviet Socialist Republic from 1939 to 1941. Between July 1941 and July 1944 L’viv was under German occupation and was located in the General Government. In July 1944 it was captured by the Soviet Red Army and the Polish Home Army. According to the agreements of the Yalta Conference, L’viv was again integrated into the Ukrainian SSR. Most of the Poles living in L’viv were resettled into Polish territories annexed from Germany. After the collapse of the Soviet Union in 1991, the city remained a part of the now independent Ukraine, for which it currently serves as the administrative centre of L’viv Oblast, and is designated as its own district within that oblast. Lviv's historic churches, buildings and relics date from the 13th century. Its architecture reflects various European styles and periods. After the fires of 1527 and 1556 Lviv lost most of its gothic-style buildings but it retains many buildings in renaissance, baroque and the classic styles. There are works by artists of the Vienna Secession, Art Nouveau and Art Deco. The buildings have many stone sculptures and carvings, particularly on large doors,which are hundreds of years old. The remains of old churches dot the central cityscape. Some three-to five-story buildings have hidden inner courtyards and grottoes in various states of repair. Some cemeteries are of interest: for example the Lychakivskiy Cemetery where the Polish elite were buried for centuries. Leaving the central area the architectural style changes radically as Soviet-era high-rise blocks dominate. In the centre of the city the Soviet era is reflected mainly in a few modern-style national monuments and sculptures. 1) The first brewery in Ukraine was founded in Lviv in 1715. 3) Beginning of the 20th century – Lviv was the only city of the world which held the residences of three Catholic archbishops: Roman Catholic, Greek, and Armenian Catholic. 4) In 1585 the printing house of Assumption Brotherhood was founded. It is the oldest printing house in the Eastern Europe which is still functioning today. 5) Ivan Fedorov published the first eastern-slavic alphabet in 1574 in Lviv. 6) In 1776 the first newspaper in Ukraine " Gazett d'Leopol " was published in Lviv.